Paul and Denise Rathnam launched Modpools earlier this year and the idea has taken off, with orders mostly coming from the hottest locales in North America, particularly California, Nevada, Texas and Florida. “The traditional pool is a symbol of excess and waste. This is a little more modern, more modest. We’re repurposing something rather than recycling. This pool can be resold, and you can take it with you if you move,” Paul Rathnam told Vancouver Sun. It’s an interesting concept, for sure, and the design, once installed, looks pretty slick. It’s as if your backyard was always destined to house a shipping container. 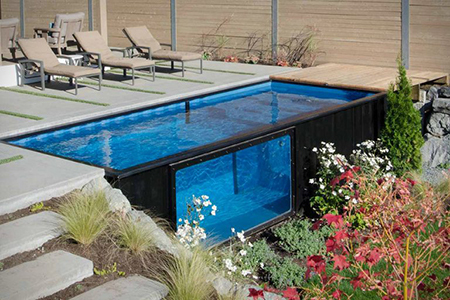 The standard size Modpool is eight feet wide by 20 feet long, and just over five feet deep. It also comes with a clear, acrylic window on one side, which is actually a pretty spiffy design element. Customers can opt to add another acrylic window on the other side for a see-through look if they want one. In Canada, after delivery, a Modpool will cost you $35,000 plus tax, which could be a cheaper alternative for families planning on installing an in-ground swimming hole. Would you buy a Modpool for your home? Tell us what you think!